In 1-quart saucepan, place 1 tablespoon soymilk and 1 oz baking bar. Heat over low heat, stirring constantly, until baking bar is melted and mixture is smooth. Cool slightly. Meanwhile, in medium bowl, beat 3/4 cup soymilk and the pudding mix with wire whisk until mixture is blended and thickened. Stir in melted white baking bar mixture until well blended. Fold in whipped topping. 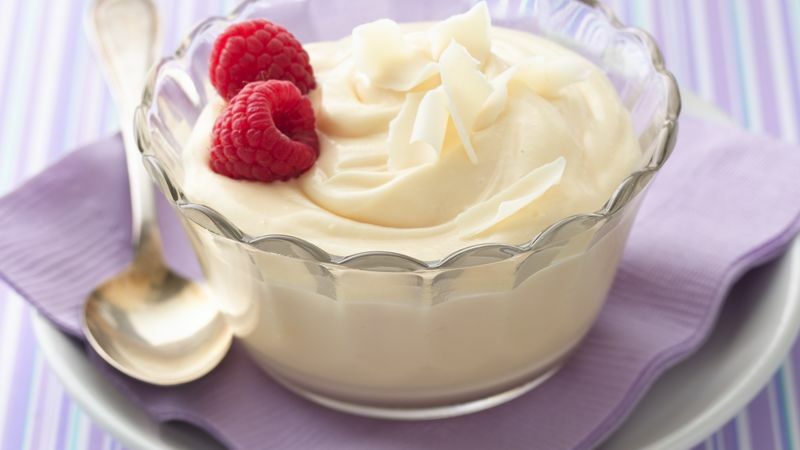 To serve, spoon into individual dessert dishes; serve immediately or refrigerate until serving time. Just before serving, top with berries; sprinkle with grated white baking bar. Use chocolate-flavored soymilk instead of the vanilla for a change.